if you want something special and impressive to decorate your living room or your bedroom, one great idea is crystals. There many kind of crystals. One very popular type, is swarovski crystals. A very common type of swarovski crystals, are animal figures. They are ideal to decorate your living room. The negative is that the price is quite high. An other type of crystal is natural crystals like amethyst. Natural crystals can look really impressive and beautiful but they need special interior design and atmosphere because they do not have a specific or symmetric shape. Natural crystals also have more natural energy, and many people use it not only for decoration but for feng shui. There are also more simple and cheap type of crystals. sometimes even common glass, when is well crafted, can look very nice. The last years there are also 3d laser crafts on glass. With a blue light it can look really beautiful and romantic. I recommend it especially for modern style interior design and for bedrooms. 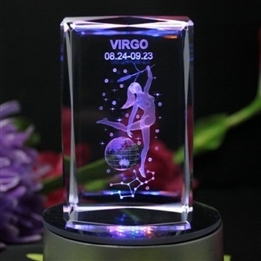 You could also have a 3d crystal lamp it at children’s room to light during the night so that children are not afraid. In such case I would recommend a fairy , a dancer or something that will create sweet or safety feelings to the children and help them relax. For a couple’s bedroom I would recommend flower 3d crafts. But there are hundrends of different crafts to choose the most suitable for you. One more positive of 3d crystals is the low price comparing to the other types. A swarosvki animal figure usually can cost even more than 10 times more than a similar 3d crystal of similar size. But my opinion is that they all worth!